Little Hall is a late 14th Century Hall House on the main square, it mirrors the history of Lavenham over the centuries. First built in the 1390s as a family house and workplace, it was enlarged, improved and modernised in the mid 1550s, and greatly extended later. By the 1700s it was giving homes to six families. It was restored in the 1920s/30s. In 1975, Surrey County Council offered Little Hall to the Suffolk Building Preservation Trust, complete with the Gayer-Anderson collection of pictures and artefacts, in addition to with two cottages. Before selling the cottages, the Trust was able to restore Little Hall. It was opened to the public in 1978 and now operates as a museum. Schools, clubs and coach parties welcome all year round by prior arrangement. Historic buildings are often best conserved by opening them to the public. 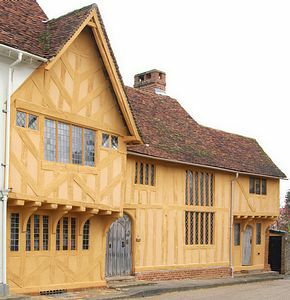 The Suffolk Preservation Society set up the Suffolk Building Preservation Trust to encourage the protection of the historic built environment in 1973. The objects are to "further the preservation in appropriate settings for the benefit of the nation, buildings or other structures, or land, of special beauty or special historic or architectural interest".